New for 2013: exclusive to Hibba Toys in the UK. 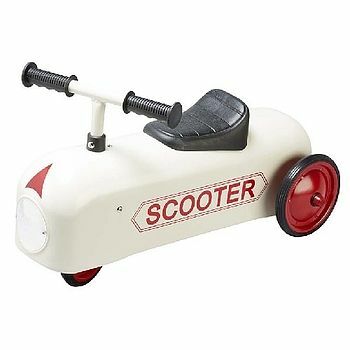 This great new retro ride on kids scooter is superb. Also features a working steering column and rubber tyres.The ride on scooter has a heavy gauge steel body and is finished in a paint that is scratch resistant, durable lead free powder coating so it is built for the toughest of kids. It also features solid rubber tyres will give the child ultra handling as well. Minor assembly required.